Manage Your Domestic Waste through Recycling : Have you ever stopped to consider just how much material you can still use in your home ends up in a landfill? In this consumer-driven error of manufactured and pre-packed goods, we generate plenty of wastes some of which are hazardous to the environment and to our health. But that need not be the case because by following the three R’s dictum of reduce, reuse and recycle, you can make waste management not only a profitable undertaking, but a fun activity for the whole family. If you can forget about the corporate bottle drives and the big blue or green plastic bins for a moment, and instead focus on what you can do at home, the number of tricks you can employ to turn recycling into a creative pastime will amaze you. It does not have to be a company steered activity for it to make sense, rather by becoming your own waste stream analyst, it is easy to devise creative ways of working at domestic waste management with the kids and everyone else in the family. Here are several easy tricks you can effectively put into practice. 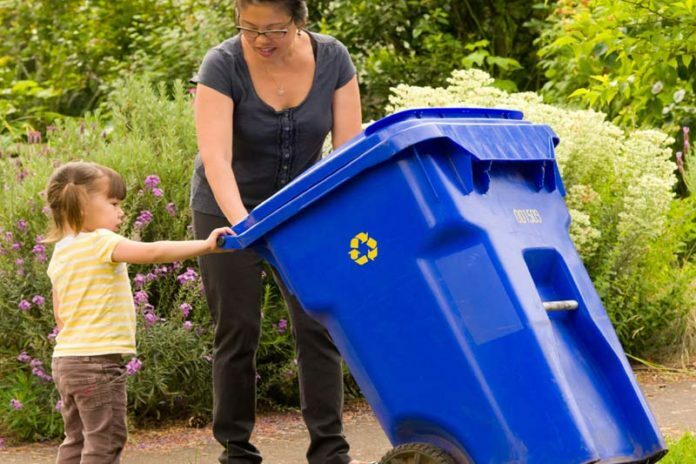 The first thing you can do at home is to make recycling part of the weekly chores involving the kids. With time, throwing away anything will seem to them like a waste because the idea of recycling things will be ingrained in their consciousness. Start by reducing the purchase of things that are not absolutely necessary by emphasizing quality of quantity. Also, create different games and competitions for recycling activities. You can reward the winner with a special treat. Strategically place the recycling bins in places where everyone in the family can see them because they visit those areas frequently, for instance under the kitchen sink for food wastes, or under a reading desk for waste paper and ink cartridges and a bin for recyclables in the bathroom. This will ensure no one throws away something meant to go into a specific bin or location. It is important to familiarize yourself and learn about the recycling program for your local area so that you can make your home system compliant. Many communities use curb side pickups of sorted recyclable materials or single stream recycling in which all recyclable materials are heaped together. If the recycling program requires all materials to be sorted according to type, have labelled bins in different places. Teach everyone to empty wastes in the right bin. A big and convenient part of recycling you can adopt is to purchase products that use recyclable materials. This ensures that the manufacturers do not exploit virgin resources for their needs. There are companies that buy such materials from the community, and apart from strengthening the recycling program, you will also be making a little extra cash on something you already used. A lot of biodegradable items that can be turned into compost are randomly thrown away. Make it a habit of building compost (that is if you have a garden) but if you don’t, you can keep them in special bin and give them to a neighbour or a company that deals in organic farming. To ensure that a lot of materials fit into the recycling bin, squeeze, flatten, and fold things such as beer cans, cardboard boxes or plastic containers. This will make it possible for you to cart away all the waste. Importantly, follow all the recycling guidelines of your area so that you do not send materials that are not needed. Also put a lot of stress on reusing rather than recycling to minimize what gets thrown away. Before you make a purchase, think of how you and reuse the item, and make it a domestic rule that nothing reusable goes into the bin. A big part of recycling is to donate what you don’t need to charities. How to Manage and Compost Kitchen Waste at Home : Explained in Five Easy Steps.